Christmas is a season of giving and receiving blessings. It’s also a hectic season of shopping, family gatherings, office parties, final exams, special programs, and unique holiday traditions. We all make important choices as we shape our plans, attitudes and activities through this Christmas season. These choices could be as simple as whether we are generous or greedy, think of others or mainly of ourselves. Are we going to be too busy to take time to be with people? Will we be stressed or let the peace of Christ rule in our hearts? The people in the Christmas story made important choices. Mary chose to be available. She accepted God’s plan and turned to give him praise, declaring herself “the bondservant of the Lord.” Joseph chose courage and obedience. Rather than be afraid he trusted God and took Mary as his wife. The shepherds chose to marvel at what they had seen and to spread the word concerning what they had been told about this child. Herod chose pride. Threatened by the birth of another king he chose to destroy in a killing rage. The wise men chose to bow before Jesus. They left everything behind to seek the King so they could worship him, giving costly gifts. Christmas is ultimately about a choice that God made. Because he loved the world so much, he sent his Son Jesus to save his people from their sins. He chose to wear earth shoes. He chose to take the form of a servant, being made in human likeness, took the form of a man, humbled himself and became obedient to death on a cross. But before the creation of the world, he made another choice. He chose us. Blessings, gifts, call them what you will, there is nothing that compares with this choice that God made. “Praise be to the God and Father of our Lord Jesus Christ, who has blessed us in the heavenly realms with every spiritual blessing in Christ. For he chose us in him before the creation of the world to be holy and blameless in his sight.” (Ephesians 2:3,4 ESV). Once we grasp this foundational and very personal meaning of Christmas we have a choice to make. We choose to ignore and reject or to embrace and believe. The blessings of Christmas belong to those who chose to believe in Christ and then live lives characterized by the spiritual blessings we have received in him. 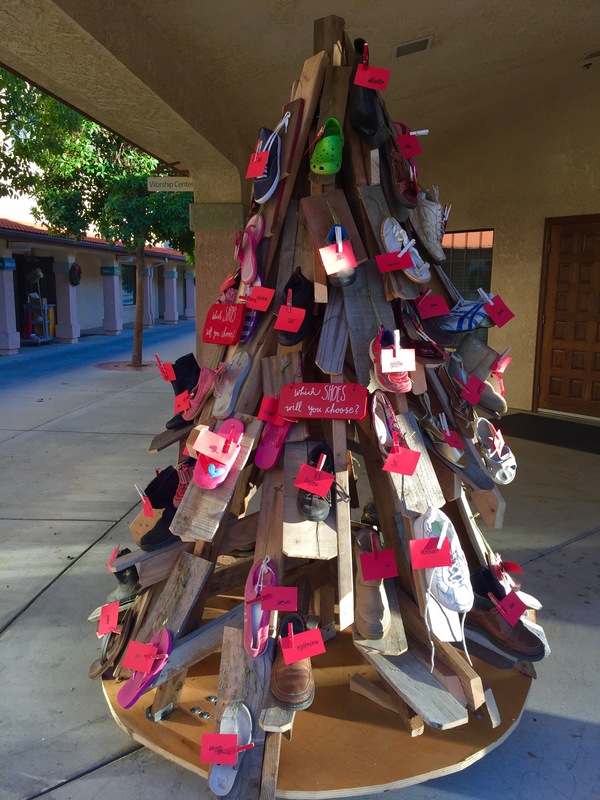 Our goal with the Christmas Shoe Tree, envisioned and built by Trinity artist, Ken Weaver, is to encourage the Trinity Church family to choose to wear the right shoes each day this Christmas season. When it comes to our plans, attitudes and activities, we ought to choose to model the attitude of the One we celebrate. Jesus’ close follower and friend, John, tells us that we ought to walk in the same way in which Christ walked. We have been chosen by God; we’ve been given every spiritual blessing in Christ, whose birth we remember. So let’s be a blessing to those around us, bringing the spiritual blessings we have been given into all of our doings and gatherings this Christmas. “How beautiful on the mountains are the feet of those who bring good news, who proclaim peace, who bring good tidings, who proclaim salvation, who say to Zion, ‘Your God reigns!” (Isaiah 52:7 NIV). Aside | This entry was posted in Bill's Blog, Christmas, Church, Evangelism, Worship and tagged Art, Attitudes, Blessing, Gifts. Bookmark the permalink.